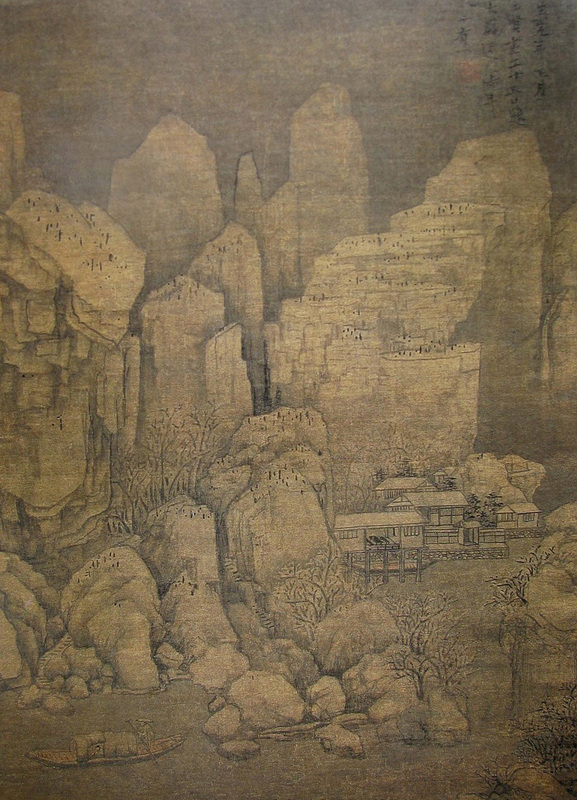 Huang Gongwang (黃公望, 1269–1354), original name Lu Jian (陸堅), went by the style name Zijiu (子久) and sobriquets Dachi Daoren (大癡道人, A Silly Daoist) and Yifeng Daoren (一峰道人, Daoist of One Peak). A native of Changshu, Jiangsu, he came from a poor family and was orphaned at an early age by Huang Le (黃樂) of Yongjia. 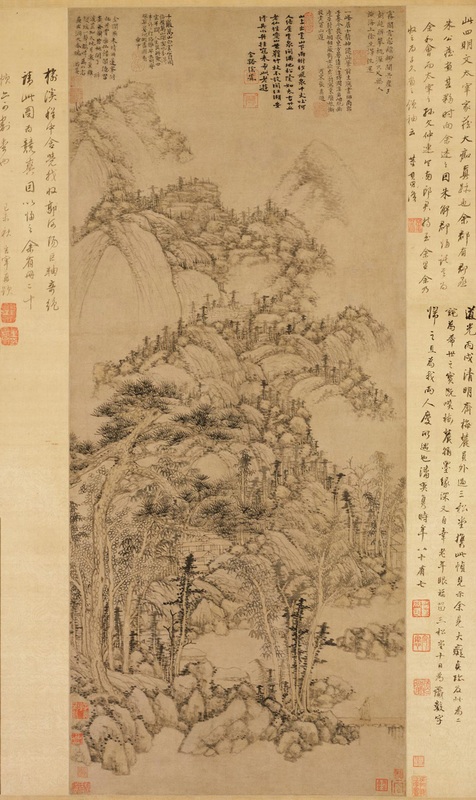 After serving briefly as an official, he withdrew from public life and studied Daoism in reclusion. 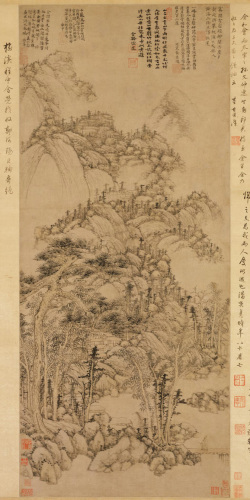 Huang Gongwang is the oldest of the “Four Great Masters of the Yuan (元四家)”, which also include Wu Zhen (吳鎮, 1280–1354), Ni Zan (倪瓚, 1301–1374), and Wang Meng (王蒙, 1308–1385). 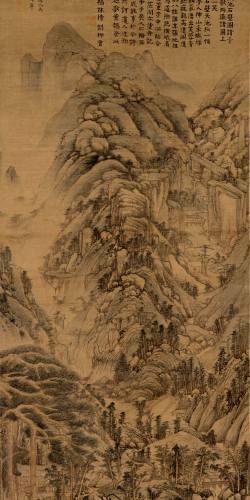 The ideals of these retired scholars had lasting effect on later Chinese art. This may be summed up as individuality of expression, brushwork more revealing of the inner spirit of the subject—or of the artist himself—than of outward appearance, and suppression of the realistic and decorative in favor of an intentional plainness, understatement, and awkwardness, which marks the integrity of the gentleman suspicious of too much skill. 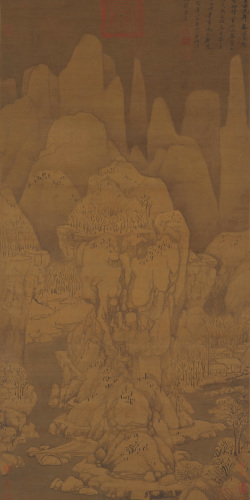 Four Masters of the Yuan, all greatly influenced by Zhao Mengfu (趙孟頫, 1254–1322), came to be regarded as the foremost exponents of this philosophy of painting in the Yuan period. 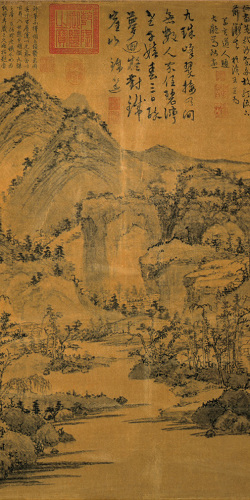 Huang Gongwang spent most of his later years in retirement in the Fuchun Mountains, near today’s Hangzhou in Zhejiang. 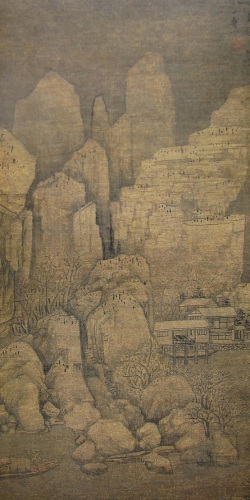 His most revered work is the hand scroll Dwelling in the Fuchun Mountains, painted with dynamic brushwork during occasional moods of inspiration between 1347 and 1350. 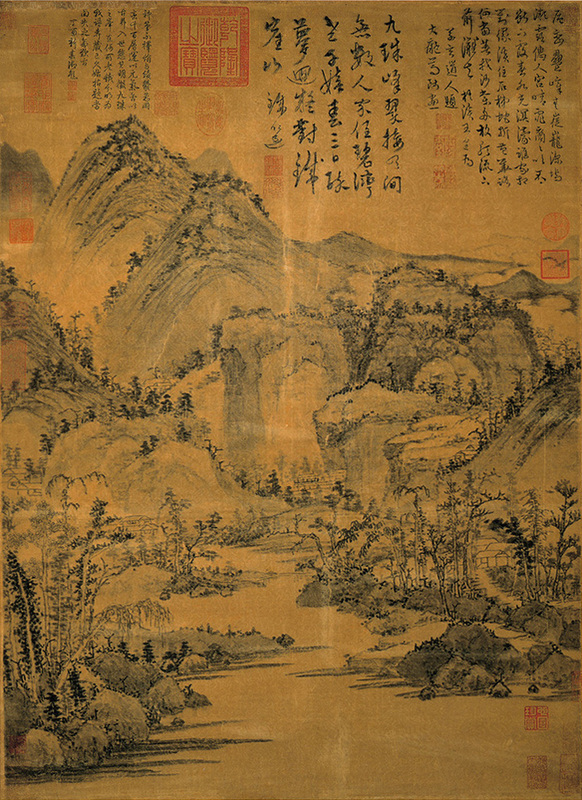 Unlike the academicians, Huang Gongwang did not hesitate to go over his brushwork, for expression, not representation, was his aim. The cumulative effect of his masterpiece is obtained not by its fidelity to visible forms but by a profound feeling of oneness with nature that set an ideal standard for later literati painting. 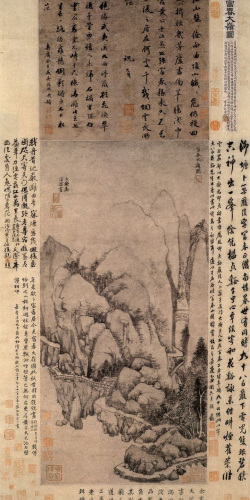 His style of and attitude toward landscape painting stand at a pivotal midpoint between such ancient masters as Dong Yuan (董源) and Juran (巨然) in the Five Dynasties period and Shen Zhou (沈周), Dong Qichang (董其昌), and the Four Wangs of the Ming and Qing dynasties.